Cost coding is not standardized across the mining industry. Mining companies have developed their own internal convention of how to group scope components and commodities into categories. The resulting lack of cost category commonality from company to company, and from contractor to contractor, creates barriers to using and sharing others’ data. Therefore, the cost performance of individual mining and minerals projects is difficult to compare for even similar scope projects. Some industry players committed to improving the performance of their mining and minerals projects recognize the value of an industry-wide code of accounts. However, many mining and minerals company managers are quick to point out the burdens that go along with adopting a new cost coding system for their company’s capital projects. Implementing a new cost coding structure entails time-consuming staff training. Plus, the new cost coding system might necessitate the procurement or modification of software applications. To them, the link between adopting a unified cost coding structure and improving capital effectiveness is not immediately clear. 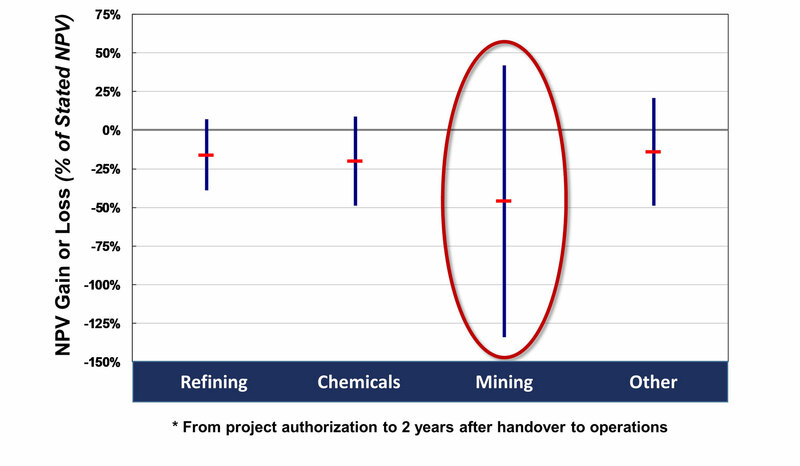 IPA has seen many company-specific cost coding structures during the course of evaluating clients’ mining projects. The scope of these mining projects ranges from ore body exploration, to mine development, to stockpiling, to tailings and infrastructure projects. While the commodities, methods, and processes for these mining projects differ greatly, a review of the scope of mining projects reveals a lot of commonality across first, second, and even third level cost categories. For instance, despite the difference in codes or category titles, many cost structures at “level 1” account for mine costs, processing facilities, and infrastructure needs. Relatively common “level 2” cost categories include the costs of major components of mine development and production systems; process facilities, including major concentration and auxiliary facilities; and major off-site and on-site infrastructures components. Differences are a bit more frequent at “level 3” as project scopes vary in accordance around the types of mines and facilities, but many cost coding similarities, such as for mobile equipment and on-site bulk storage, can still be identified among companies. Without industry-wide recognized cost codes, cost comparisons are less reliable. Contractor cost data for mining projects cannot be compared on an equal basis. What’s more, cost models are difficult to develop. To be certain, if mining companies could agree on a shared cost coding arrangement, they would be able to deliver projects more effectively. A good example of an industry benefiting from a uniform cost coding structure is the oil industry’s widespread acceptance and use of the Norsk Sokkels Konkuranseposisjon (NORSOK). For the last few years, IPA has been working with several of the world’s leading mining and minerals companies to create a uniform cost coding structure suitable for use by owners and contractors alike. In 2014, a joint steering committee comprising Anglo American, Barrick, BHP Billiton, and Rio Tinto was formed. A short time later, the steering committee agreed to sponsor an IPA-facilitated cost coding structure study. For the study, each of the four steering committee members reviewed each other’s cost coding structures and practices. The steering group and IPA determined that at the highest breakdown structure levels, project costs, more often than not, are categorized and defined the same way. They are just coded differently. Consequently, the steering group committee members were able to consolidate the individual coding structures into a single coding structure that all four companies can use to meet their project cost coding requirements. The result—after many meetings and review periods—is the first version of the Mining and Mineral Processing Uniform Cost Coding Structure (MMP-UCCS), which was approved by the steering committee in mid-2015. Since the beginning of 2016, the MMP-UCCS has been used on a trial basis on projects funded by the steering committee member companies. Early on, one of the steering committee’s key objectives was to share the common cost coding structure for mining projects with a large audience of cost engineers and project professionals. At the AACE International 2017 Annual Meeting on June 12 in Orlando, Florida, the MMP-UCCS was introduced to a large industry audience for the first time. AACEI’s Technical Board has agreed to process the MMP-UCCS as a Recommended Practice (RP). The proposed cost coding standard will go through a rigorous review process before being accepted as an RP for use by the mining industry and contractor community. The release of the MMP-UCCS, as it happens, coincides with the recent uptick in project activities in some regions, driven by modest commodity price increases. This is a good time for the MMP-UCCS rollout. At the AACE International event, IPA Mining, Minerals, and Metals Business Area Manager Baqun Ding presented a technical paper covering the MMP-UCCS’s development, purpose, and design. As the paper explains, the uniform coding structure for mining projects is not in itself meant to improve the development of project cost estimates or substitute for a company’s existing Work Breakdown Structure (WBS). Rather, it is hoped that the industry will embrace the code as a means of increasing its visibility into project costs. The value of its adoption will be shared and recognized as more companies adopt it. The vision for the unified cost coding structure is to improve capital efficiency by facilitating transparency between mining and minerals owner companies and contractors. Adoption of the cost coding structure also will enable the development of mining-specific cost metrics to be used in evaluating and benchmarking projects at different levels. For more information about the MMP-UCCS, please contact Baqun Ding, IPA Mining, Minerals, and Metals Business Area Manager.